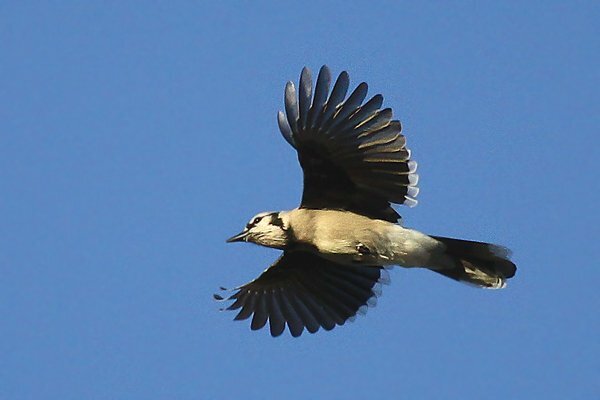 Though Blue Jays often manage to avoid letting me get a decent shot of them I managed to outsmart the clever corvids yesterday. I was at Kissena Corridor Park in Queens and noticed a steady stream of Blue Jays flying out of the park to a particular backyard and then flying back in to the park, generally following the same path. Slightly closer examination showed that they were going to fetch acorns! Each bird I spotted making the acorn run was actually carrying at least two acorns. Can you figure out where the rest are? 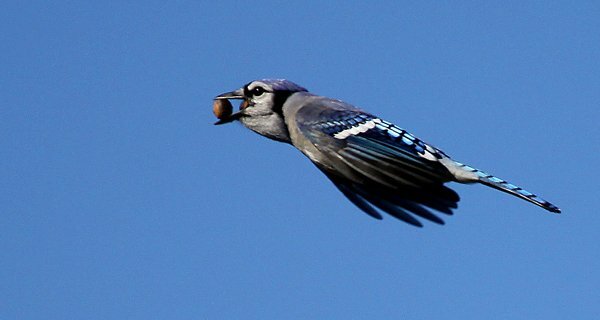 That’s right, the clever jays are carrying additional acorns in their crop! 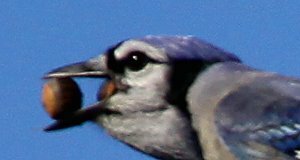 Here’s a close up of the picture above to show you skeptics that Blue Jays really load up on acorns when they have the chance. Noticing that the birds had more than one acorn made me wonder if they were caching them somewhere. I did not have time to follow them to wherever their actual destination in the park was but it is high on my list of things to figure out. Anyway, enjoy these shots of Cyanocitta cristata. Make sure to check out how the bird is using its tail as a rudder in the last shot. I’ll let you know if I figure out if and where the jays are hiding their acorns. Just promise not to tell the squirrels! Corey , these photos are amazing. Blue Jays are amazing. Thank you. 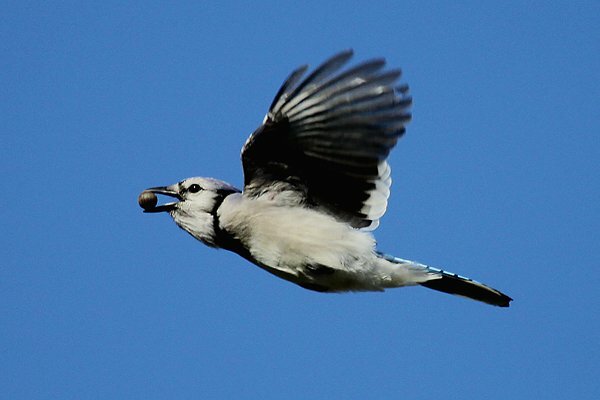 Blue Jays are my favorite bird and one of the reasons is because of the role they play in reforestation of our ecosystems via caching their food. 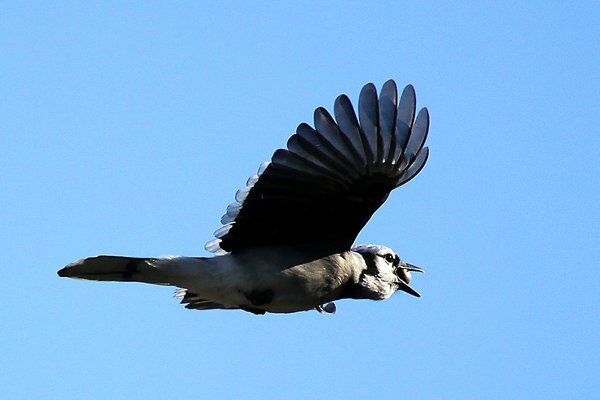 Very nice shots capturing an important behavior of the Blue Jay. We have to ration the peanuts in our peanut wreath, or the Western Scrub Jays will empty the whole thing in a day and store them somewhere. So we put a few out each day to keep them hanging around our yard. Blue Jays are beautiful – I miss them now that I live in the western part of the US. I raised a blue jay from a baby and before it went back into the wild i learned so much from it. They do cache food all the time. They love bright objects and jewelry and will tuck it in the most unusual places. They have good memories and will go get the item weeks later. They absolutely love cashews. It is their favorite thing. They have a fearless nature. They can sing like a songbird – not just the loud shreaks that you hear outside. They can warble and sing beautifully. If I am out in the yard and they see me they will come and fuss and cry to get my attention until I go and put cashews on the bannister for them to eat. They are smart birds.